Bundt Cake Saturday! But Monday instead! Basketball playoffs and Carnaval celebrations in the Mission and Spamalot opening downtown, oh my. So much going on right now. 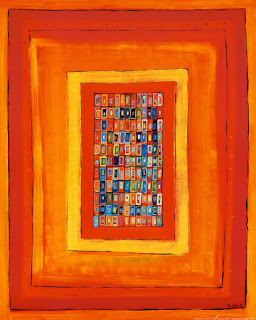 I dig this time of year, here on the precipice of summer. The fog has reliably rolled in these past several days, blanketing the City in cold and wind, and I've been rocking the long sleeves/jeans/sweater/coat combo, which can only mean one thing: June is afoot. Again with the delay this weekend; sorry. It's not like you're reading this anyway; you're staring into a smoky grill poking hot dogs on skewers wearing cutoffs and a halter top in 80 degree sun right now, not sitting in front of your computer. Saturday was busy with brunch and people and things going on, and yesterday likewise, so here you go with your [exhausted and slightly hung-over] bundt cake edition. 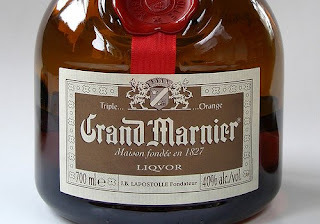 Grand Marnier - a classic French orange-infused liqueur, if you're not familiar with it - is great for baking, especially with chocolate. We had a bottle on hand in our ever-expanding liquor cabinet, so I pulled that out and went to town. The result was pleasingly citrusy and moist. Preheat oven to 350; grease and flour your bundt pan. In a mixing bowl, combine cake mix, pudding, orange juice oil, yogurt, orange rind, eggs, and orange liqueur. Mix until blended. Pour into prepared pan. Bake 40 to 45 minutes or until center of cake bounces back when touched. Remove from oven and cool in pan for 10 minutes; invert to wire rack and cool completely. If you don't have Grand Marnier, feel free to substitute Cointreau or Triple Sec instead. I baked this Friday afternoon and let it sit overnight; came home from brunch Saturday and was planning to use the orange marmalade/Grand Marnier glaze outlined in the original recipe. Once I made it, though, it was disgusting - lumpy and gross - so I threw it out, did some quick Googling and came up with a homemade Grand Marnier buttercream frosting instead. It was ever-so-much better. Just beat that with an electric mixer, adding OJ and liqueur as necessary, until it's thin enough to drizzle. Then pour over the finished cake. The light and fluffy glaze has just enough of a hint of Grand Marnier to really give it some spark. 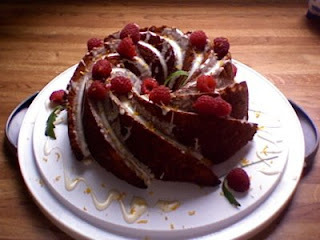 You may want to poke a few holes in the cake with a fork as well to let it soak into the bundt itself. I had some fresh raspberries in the fridge, so I sprinkled them over the cake, and grated some remaining orange zest on top, as well. Finally, I added a few shoots of bear grass and zinnia leaves from the arrangement on the coffee table. And that was it. Great new recipe. Consider it for your next summer function. Cheers.